A rapsodi is a musical representation of the epic, a narrative folk-song which tells the story of an historic event. It is associated mostly with northern Albanian folk culture, and is primarily sung as a solo accompanied by a single instrument (such as the lahuta, a one-stringed bowed instrument). Epics are a central part of Albania’s folk tradition, as its identity is grounded in history and the sense that its people are descended from ancient Illyrian tribes. This CD is also an epic: it tells the story of a piano tradition unique in the world, birthed in the twentieth-century and nurtured under the communist regime of Enver Hoxha (1944-1985). The composers represented on this CD are some of the most revered in the cultivated music tradition of Albania, though they themselves were limited in what they could write. Under the communists all pieces ‘should be moulded from the soil of this land, should be inspired by the creativeness, the work, and the aspirations of this people, and dedicated to them, the people should like them and be encouraged by them. To this end, composers were expected to include folk elements: these took the form of folk melodies, folk rhythms, imitation of folk instruments, use of folk dance patterns, folk harmonies and modes. I interviewed Çesk Zadeja (born in Shkodra, 1927-1997) in November 1995. He studied at the Tchaikovsky Conservatory in Moscow from 1951-56, and wrote works for orchestra, choir and ballet, as well as a piano concerto and smaller instrumental pieces. Zadeja spoke about his experience of censorship under Hoxha’s regime and the role of the League of Artists and Writers (LAWA), which was responsible for setting conditions of composition and performance. LAWA gave commissions to composers and decided whether a piece was acceptable: all new works had to be approved before they could be publicly performed. The communist publishing houses acted separately and could reject any piece they wished. Zadeja spoke of working the system to his advantage, and if one government body rejected a piece then going to another for approval. He remarked that the artistic climate under communism was one of freedom within imposed restrictions. Zadeja was recognised with the highest honour bestowed on a musician in Albania by being given the title ‘Artist i popullit’ (Artist of the People)by the government for his services to music and in recognition of his status as a composer. Tokkatawas written in 1952 and is a mainstay of the Albanian piano repertoire. Alternating semiquavers between the hands imitate the effect produced by the çiftelia, a plucked folk instrument of two strings, one melodic and the other a drone. The second theme is set pianissimo with a triplet accompanying pattern. Later, the dotted figure from the end of the second theme is developed in a march-like section, which leads back to the opening toccata figuration. The second theme then returns, followed by a brief passage of the çiftelia pattern, which leads to the coda, where the march motive is placed in the left hand and set against scale and arpeggio patterns in the right. Tokkata is brought to a thundering finish in a rising storm of alternating notes an octave apart between the hands. Zadeja’s Theme and Variations in E minor are based on an irregularly-phrased folk-like melody, set in one three-bar phrase followed by two six-bar phrases. Melancholic in nature, the theme is then put into four and eight-bar phrases in the first variation and placed against a gentle, lulling accompaniment. In the subsequent variation the melody is decorated with triplets and grace notes and set against answering left-hand semiquavers. Next, Zadeja switches to the key of A minor with anAllegro variation featuring six notes to the beat in scintillating passagework. Remaining in A minor, the next variation juxtaposes a version of the melody in the left hand with chordal semiquavers in the right. Moving into F lydian, an Andante sostenuto variation follows in which Zadeja introduces a barcarolleaccompaniment as a backdrop for the melody. This leads directly into the final variation (again in A minor), an Allegro con fuoco of syncopated chords and octaves, which brings the piece to a fiery, A major, climax. I spoke with Feim Ibrahimi (born in Gjirokastra, 1935-1997, ‘Artist i popullit‘) in his Tirana flat in November 1995. Ibrahimi studied with Tish Daija at the Conservatory in Tirana, being one of the first composers entirely educated in his own country. He served as secretary of the music section of LAWA from 1977-1991. Ibrahimi said that communism had compromised his style as there was tremendous pressure to stay within the system, but that he had attempted to write valid works in spite of these restrictions. Interestingly enough, he was told that his use of pulsating rhythms, fragmentisation of melodies and unconventional harmonic resolutions, all of which are evident in the two pieces on this recording, were not in line with social realism. Ibrahimi explained that he used folk elements as a shield to cover his real intentions as a composer. He wrote works for orchestra, ballet and choir, as well as two piano concerti and smaller piano pieces. Vals (Waltz) is searching and melancholic in nature. Written in B minor, the piece opens with a G major 7th underlying harmony, implying the lydian mode from the outset. The sense of unsettledness continues in the phrasing: the melody is set in two four-bar phrases followed by a five-bar culmination. The cadence at this point reflects Ibrahimi’s stretching of the norms: rather than a dominant to tonic resolution, Ibrahimi uses a F dominant seventh to resolve to B minor, therefore with a root relationship of a diminished fifth. The brief middle section is a recitative-like, with the contrasting material first placed in unison between the hands and then in tenths. The opening theme returns to complete the simple A-B-A structure, with the decorated melody interspersed with secco quaver chords above a strong sense of G lydian in the left hand. Tonin Harapi (1928-1992, ‘Artist i Merituar‘ [Artist of Merit]) died the year before I first travelled to Albania. He studied at the Tchaikovsky Conservatory in Moscow and then completed his studies with Zadeja at the Tirana Conservatory. Highly regarded in Albania as a composer of great stature, Harapi’s output includes operas, works for choir and orchestra, songs, a string quartet and a piano concerto, as well as a plethora of pieces for solo piano. A piano competition is held regularly in Tirana in his honour. The first movement of Sonatina follows sonata-allegro form, with the opening theme in C minor followed by the second, dolce, theme in the relative major. The development section works through permutations of both themes in various keys and guises before the return of the main subject almost verbatim, and then followed by the second subject in C major. Various elements of the development section are briefly used in expounding this material before the arrival of the coda, in C minor, which builds upon the main theme through chord and octave sequences, rising to the upper end of the keyboard before resounding unison Cs have the final word. The key relationship between the movements of Sonatina are those of Beethoven’s Op. 13, the Pathetique Sonata. The second movement, in A-flat major, opens with a warm accompaniment pattern in thirds which provides a back-drop for the entry of the melody in a higher register. The recitative-like melody offset against the unrelenting thirds is modified and decorated through various keys before winding down to a low A-flat major sonority. The final movement of Sonatina is a straightforward rondo, with the lively theme interspersed with two contrasting sections. Harapi alternates bars of 2/4 and 5/8, and uses elements of Albanian folk dance to give the piece edge and excitement. Harapi’s Temë me variacione (Theme and Variations), published in 1966, is one of the best known pieces of this form in the Albanian piano repertoire. With a folk-like melody in G-minor, the theme is set in 2/4 time in a combination of three and two-bar phrases, with the penultimate bar in 3/4 time. This irregular structure is maintained through much of the work, lending the piece a distinct folk flair in both rhythm and melody. With nine variations altogether, Harapi transforms the theme by various devices: melodic decoration and sharing the melody between the hands (variation 1); quick broken chord figuration (var. 2); a march-like style (var. 3); melodic semiquavers (var. 4); a distilled, quietsarabande (var. 5); a martial, bombastic arrangement (var. 6); repeated chords (var. 7); a brilliant,leggiero, alternating hands pattern (var. 8); and a final, extensive, variation which has its own second theme and development. This last variation leads to a grand restatement of the main theme, with full orchestra being brought in for a majestic conclusion. A. Komnino’s Këngë polifonike (Polyphonic Song) is a simple piece in ABA form. Questing and timeless, Komnino explores two-part polyphony using chromaticism in the accompaniment of the melody and parallel tenths in setting out the first part of the middle section. The next piece, Këngë(Song), features a mirror phrase structure: A, B, C, C, B, A. This is cleverly done by putting the material in different octaves when it recurs in the B and C phrases. The overall effect is beautifully hypnotic, with one phrase eliding into the next. Tish Daija (born in Shkodra, 1926-2004, ‘Artist i popullit‘) is credited with writing the first Albanian string quartet (1953) and the first Albanian ballet, Halili dhe Hajrija (Halili and Hajrija, 1963). Having studied in Moscow at the Tchaikovsky Conservatory from 1950-56, he also wrote pieces for symphony orchestra (Një ditë pikniku, ‘A Day at the Picnic,’ 1955) and operas (Pranvera [The Spring], 1960). This little Vals (Waltz) reminds one of Satie, both in the accompaniment pattern as well as in the placement of the melody. The irregular phrase structure consists of three and six bar groups, with interjections of four-bar phrases. A minor 9th chord finishes this simple waltz with a quirky flourish. Baresha e Vogël (The Little Shepherdess) by Jani Papadhimitri is a folk-inspired piece. The undulating accompaniment sets the stage for a melody that one could imagine being played on a fyell(a recorder-like flute), decorated with short trills (also an element of folk improvisation). The melody has a small compass: only six notes are used in the right-hand in the entire piece. This is also a key folk element, as the fyell was based on a heptatonic scale (seven pitches). A folk dance can be heard in the rhythmic phrase endings of the middle section, and folk harmony is evident in the use of parallel fifths in the accompaniment of the same section. I also interviewed Alberto Paparisto (born in Elbasan, 1925) in November 1995. Primarily a musicologist, he studied at the Tchaikovsky Conservatory in Moscow from 1951-56. I was immediately struck by his sense of humour: he is a lively, personable man, and these traits are reflected in hisScherzo and Valle. The first is quick and playful, the second angular and jolly. Scherzo begins with a brief introduction which leads to the primary material, a semiquaver melody which dances up and down the keyboard. This is developed in runs and parallel first-inversion triads and ushers in an introspective middle section of a more dramatic nature. The opening theme returns in full and is followed by a brief coda of unison scale patterns which collapse in a giggle. Valle (Dance) is light and fun, with the opening motive, accentuated by colourful dissonance, unifying this charming piece. I first met Kozma Lara (b. 1931, ‘Artist i Merituar‘) in Tirana in 1995. He also studied composition at the Tchaikovsky Conservatory, but his studies were interrupted in 1961 when Albania broke off relations with the Soviet Union. He returned to Albania to complete his studies under Zadeja at the State Conservatory in Tirana. Lara’s compositional output includes five piano concerti, four rhapsodies for piano and orchestra, six piano sonatas, four ballades, four albums of piano pieces, one set of theme and variations (1965) and eight piano preludes (1997). Lara’s Ballade no. 2 (1983) is based on the rich folk tradition of epic ballades. This ballade opens with a recitative in single notes which leads to the main theme in C lydian. Parallel fourths, fifths and seventh chords support the melodic development as the material grows into bigger chordal expressions of the narrative. A contrasting middle section explores a gentle dance-like second theme, before returning to a condensed version of the ‘A’ section. This builds into an abrupt, jagged ending: a cry of anguish to end the epic. Ramadan Sokoli (b. 1920), an esteemed Albanian musicologist, wrote Rapsodi Shqiptare nr. 2(Albanian Rhapsody no. 2) in 1961. Narrative in nature, one is reminded of a Liszt Hungarian Rhapsody in the extemporaneous unfolding of melody, though this piece does not reach the technical highs associated with the virtuoso pianist-composer. I first heard Rapsodi played by Lili Tafaj during our interview in the Recital Room of the Opera and Ballet Theatre in Tirana, on an old baby grand piano which had seen better days. Lili is an emotive pianist, and as she talked and played through various pieces in her concert repertoire her eyes grew moist with nostalgia, recalling her performances and work with many prominent Albanian composers. Albanians, whether in the developed classical music tradition or in the folk tradition, are passionate about music. Following a concert I gave in Tirana, the folk band at the restaurant afterwards began to play The Snowdrop (1949) by Simon Gjoni. This song is a national favourite, and the entire table of eminent musicians, including the head of the Music Faculty as well as government representatives, stopped eating and chatting and joined in full throttle to all of the verses of the song, with tears in their eyes. This passion comes through in RapsodiShqiptare nr. 2, an arrangement of two folk-like melodies. Sectional in form, an introduction leads into the first tune, set in an improvisatory style and then developed with sequential pianistic flourishes. The second melody is placed in thirds in the right hand accompanied by demisemiquavers in the left. After rhapsodic expansion on this material and a brief cadenza, the second theme returns. Elements of the introduction follow, culminating in a chordal, theatrical ending. Simon Gjoni (born in Shkodra, 1923-1991, ‘Artist i Merituar‘) studied conducting in Prague from 1952-1958, and upon his return to Tirana worked at the Opera and Ballet Theatre. He toured China in 1967, and was one of the founders of the Albanian Radio-Television Symphony Orchestra. Gjoni was instrumental in introducing many standard orchestral works in Albania, including Beethoven’sSymphonies nos. 7 and 8, Mendelssohn’s A Midsummer Night’s Dream, Grieg’s Peer Gynt Suite and Dvorak’s Slavonic Dances. He was one of the first lecturers at the newly founded State Conservatory of Tirana in 1961. As a composer, he wrote over two hundred songs, pieces for solo instruments, cantatas and major orchestral works (Four Albanian Symphonic Dances, the Symphonic Suite‘Albania Celebrates’ and the Symphony in E-flat major). Prelude in E minor (1965) is a mesmerizing miniature with the solo melody set above a repetitive left-hand accompaniment. It is ageless, giving a sense of Albania’s ancient history marching through time. Tokata (1968), in 7+5/8, is a vivid depiction of a north Albanian folk dance. A drum motif, which one can imagine resonating in the mountains, opens the work Gjoni uses repeated notes, chromatic patterns, unisons between the hands and alternating fourths in capturing the flavour and excitement of the dance. First, I am sorry to say that I somehow missed Volume 1 of Kirsten Johnson’s enterprising series of Albanian Piano Music not least because this volume is so enjoyable and fascinating. I can only suggest that anyone with a particular interest look it out, especially in the light of what I will say about volume two….Some of the intimate nationalistically-inspired pieces have a real charm and at times made me want to book the next plane to Tirana. One in particular was Papadhimitri’s ‘Little Shepherdess’ with its simple melody over a modal drone bass. Papadhimitri clearly has a way of making a simple idea so effective….Johnson plays with real sympathy. I had not heard these works before – who has? – and of course have no scores. She is however a perfect advocate and a true enthusiast for this little known music. 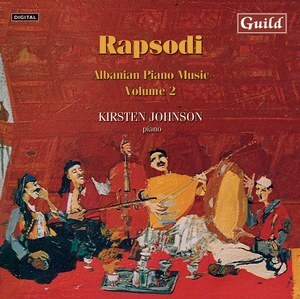 It was three years ago that Kirsten Johnson’s first exemplary CD of Albanian piano was issued by Guild. All of that music was completely new to me (and probably to all but a few other listeners), as is the music on this second volume, but some of the same composers’ names re-appear. The older generation of Ibrahimi and Harapi, Kozma Lara and Sokoli are represented, as is the newer name of Papadhimitri (b. 1948). Amongst the elder composers – that is, those born just after the end of the 1914-1918 war – we can hear how profound was French influence before the Iron Curtain came down on Albanian music. Ibrahimi’s Waltz and Harapi’s Sonatina particularly show a French neo-classical influence combined with late 19th-century bravura style (apparent in much of this Albanian music) that is wholly engaging. According to Ms Johnson’s excellent notes, Ibrahimi was often taken to task by the League of Artists and Writers for his use of pulsating rhythms, fragmentation of melodies and unconventional harmonic resolutions that went way beyond the bounds of Hoxha-approved social realism. By decree, all the composers had to make use of folk elements in their work: when Ibrahimi met Kirsten Johnson in 1995 in Tirana he told her that he had to ‘shield his true intentions as a composer’ by using such elements. The results make for interesting listening.